With all the malt liquor drinks out these days, I haven't a clue in what makes the majority of them "premium." My guess is that premium is a word that means, well, nothing. But, it does make it sound a bit fancier. So hey, I'm going to start saying that Bob's Brew and Liquor Reviews is a Premium Alcohol Review Website. This time, I'm reviewing Smirnoff's new Blueberry & Lemonade malt liquor "mixed drink." 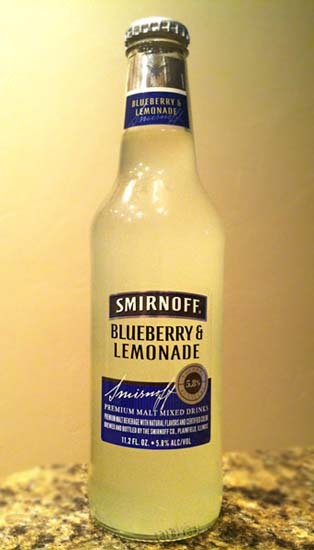 Now obviously, Smirnoff's Blueberry & Lemonade isn't a real mixed drink, but rather a flavored malt liquor trying to replicate a mixed drink. In the past Smirnoff's malt liquors have disappointed me by being far too sweet and far too artificial tasting, but I have to say, this one surprised me! Smirnoff Blueberry & Lemonade smells like lemons, sugar, and hey, you guessed it, berries. No shock there, but tasting is where I was caught off guard. I expected artificial and syrupy sweet flavors with a bitter aftertaste, but instead I got what tasted just like real lemonade from lemons, along with white sugar with only hints of blueberry. The sweetness was actually quite tame and the whole thing was surprisingly refreshing, drinkable, and actually pretty damn tasty. Smirnoff Blueberry & Lemonade is far and above the best malt liquor I've ever had. Even similar contenders like Mike's Hard Lemonade aren't even close. I'm hoping Smirnoff continues this trend, because most malt liquors are disgustingly sweet to mask the adjunct grain tastes. But somehow this one is balanced, refreshing, and actually worthy of purchasing again. Drink This: if you want to try the best malt liquor I've tasted thus far. And yes, most are gross. This one, not so much. Don't Drink This: if you're simply opposed to the idea of malt liquor.